Thanksgiving Day as it is constituted as a civil holiday in the United States (and Canada) is not specifically found on the Orthodox liturgical calendar, but that doesn’t mean that Orthodox Christians in North America have ignored it. 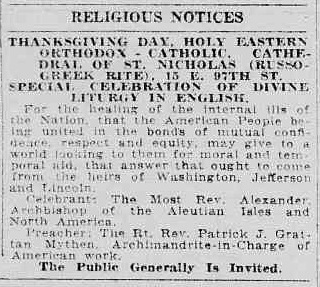 Here’s a notice from the New York Tribune for a Thanksgiving Divine Liturgy held at St. Nicholas Cathedral in 1921, celebrated by Archbishop Alexander Nemolovsky and Archimandrite Patrick Mythen. From all of us here at SOCHA, Happy Thanksgiving to all who are celebrating today!